Why is geothermal energy such a hot (and cool!) topic? Because saving money on energy costs becomes top priority when electric bills peak in summer and winter. This may leave you wondering — is there a better option than my traditional heating and cooling system? A geothermal system could be the answer, depending on your goals and house specs. Read on to see if harnessing the earth’s temperature is a powerful move for you. One of the big wins for geothermal heating and cooling is that it doesn’t burn fossil fuels. Instead, these systems use electricity to access the earth’s internal temperature and channel that energy into heating or cooling your home. The magic is that the earth’s temperature stays constant no matter what the weather is outside — typically 45-75 degrees Fahrenheit. Which means in the summer, the earth’s center is cooler than outside air and in winter, it’s warmer than the frozen ground—making it easier to keep your indoor temperature consistent and comfortable. 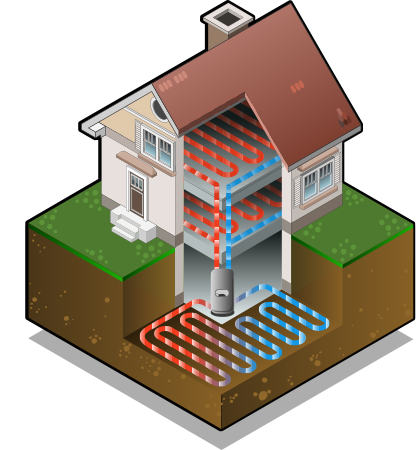 A geothermal heating and air system works a lot like a heat pump. It pulls heat from the earth into your home during the winter. And in the summer, it transfers unwanted warmth back below the earth’s surface. As a bonus, your geothermal system can use excess heat from this process to provide hot water for your bathing, laundry and dishwashing. There are 4 different types of systems that dealers will recommend, depending on the layout of your house and surrounding property — open, pond, vertical and horizontal. A professional dealer and installer, like your local Trane Comfort Specialist, can advise you on what type of geothermal system would best fit your home. Whatever your goal, there’s good reason to go geothermal when you’re building a new energy efficient home or retrofitting an existing property. If you’re debating a new system, here are 5 solid incentives for saying yes. Nearly 50% of your energy usage goes to heating and cooling your home, so it’s smart to take measures to reduce your usage of fossil fuels and make your carbon footprint a little smaller. Because this type of system uses the consistent temperature of the earth, geothermal is a sustainable, renewable energy source that won’t run out and will remain efficient year after year in every kind of weather.Geothermal heating and cooling systems use 25%–50% less electricity than conventional systems. And according to the US Environmental Protection Agency (EPA), geothermal heat pumps can reduce energy consumption and emissions up to 44% in comparison to traditional heat pumps. This number jumps to 72% when compared to electric heating paired with standard air conditioning equipment. It also reduces noise pollution and is one of the quietest systems available with sound levels as low as 59.2 dB. By using less energy, you’ll automatically save money. The EPA reports that homeowners save 30-70% on heating and 20-50% on cooling costs with geothermal energy. This can add up to $400 to $1,500 in savings each year.It’s true that with geothermal systems, it can take 5-7 years to see your investment pay off. And installing this type of system could cost twice as much as a traditional system. But your increased savings on energy bills will help you recoup that investment by returning up to 4 dollars of heat for every dollar you spend on electricity.Another financial perk is that geothermal systems are simpler and need fewer repairs. And they last nearly 25 years longer than a gas or electric heating and cooling system. Which means an initial investment can save you a nice chunk of change over the years, while keeping you comfortable year round. One last benefit for your wallet. Geothermal systems often quality for product rebates, tax credits and energy-efficient mortgage discounts, so be sure to research those extra savings before you buy. They can sometimes make the price of the geothermal equipment nearly the same or even better than a traditional system. You can certainly retrofit geothermal systems with an existing home if you have the proper space and specs. But it’s definitely easier to build a great system when you’re starting from scratch with a new home. Then you can add on extras like radiant heating for floors, driveways and greenhouses.Plus, you’ll have a clean slate to place your underground components. A geothermal system might also be appealing to homebuyers, if you sell your house in the future. On a chilly winter night you may experience energy efficiencies between 300%-600% with a geothermal system, as compared to 175%-250% efficiency rates for traditional heat pump usage in the winter.The real value of geothermal energy is revealed when you read the reviews. Customers report that cold winter mornings are less harsh because geothermal heating maintains a consistently comfortable temperature, so you wake up warmer. Good news! Geothermal provides the same consistent, comfortable temperatures for homes in warmer parts of the country, too — which is great for reducing your energy costs in the heat of summer. According to the U.S. Department of Energy, a geothermal heat pump keeps indoor relative humidity around 50%.Though you may want to add a dehumidifier to your setup to make sure it stays extra cool in climates where humidity is higher than normal. When you’re looking for a geothermal HVAC system that’s unstoppable, Trane EnviroWise™ Geothermal Systems are a smart option to consider. You can choose from 3 system types that are thoughtfully designed and rigorously tested to adapt to any region, in any home. All-in-one packaged systems harness the full power of the earth’s energy in a single, sleek unit. Be sure to take a look at the Trane TVGX series which offers the ultimate in performance with an EER surpassing 40 and a COP of more than 5, which means your equipment is ultra efficient. It’s true variable-capacity compressor and variable-speed blower matched with a fully communicating control package provides comfort and efficiency at the highest level possible. Trane EnviroWise™ water to water geothermal systems heat and cool your home by circulating fluid underground and transferring heat to another fluid loop built into your home. These systems are eco-friendly, energy-efficient, extremely quiet and can be paired with Trane air handler units. If you have limited installation space in your home, a Trane EnviroWise™ split geothermal system would be ideal for you. These systems use a ground loop connected to a refrigerant loop to absorb or dissipate heat. They work a lot like a traditional heating/cooling system and are paired with an air handler or furnace inside your home. Ready to save money on your energy costs with a geothermal HVAC system? Reach out to your local Trane Dealer to learn more about why geothermal HVAC systems are so energy efficient and how one would work best for your home.